Today, be as good to yourself as you are to your closest friend. You may find the advice you give yourself is sounder, the kindness you show yourself is greater, and your ability to let some of the nonsense go, more finely honed. Be who you are to those you love – and turn some of that emotional generosity inward. Let me know how you do. Happy Thursday all. Posted on July 5, 2012 by mimijk •	This entry was posted in friendship, inspiration, life lessons, love, mindfulness. Bookmark the permalink. Profound yet simple. thanks Self-talk is more important, and more frequent than most of us realise. Absolutely – I often will ask people who are in conflict about something – “What would you tell your best friend if s/he was in this same situation?” The responses are invariably different – and far more honest, helpful and kind. 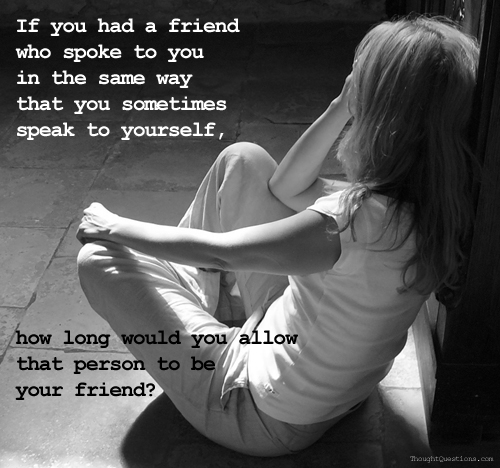 We talk to ourselves all the time, just not necessarily as we would a close, loved friend. I *do* know that I am loved and incredibly blessed to have so many fabulous cheerleaders in my corner, but I have my moments of weakness. :-/. Thank you for the long-distance virtual hug and reminder. 🙂 I CANNOT believe it’s gotten hotter there–yikes! Thank goodness you are back online (in every sense of the word) and can hide away inside. Take it easy, ok? I am – and hope you are too. We’ve topped 100 degrees today – without the heat index or humidity. And we all need cheerleaders sometimes – and I’m here for you with pom poms in hand.. So easy to forget. Thanks for the reminder Mim…so much time is spent making sure the ones we love and care for are happy and lifted…which makes our lives happier…but we tend to forget we need the same at times. And what better way to begin, than taking our own best advice. Such a simple message, yet huge. Why we don’t treat ourselves as we treat our closest friends…it’s a question I think about often, for there is no question that I could be better to myself – less judgmental, critical. And I know I’m not unique..
LOL, well I’m sure he noticed…he was just “tired”. So good to have you back! Right…:-) Tired…I’m so happy to be back!!! What a thought provoking post. With the loss of power the past few days, I feel like I’m not operating at 100% yet, and thus I may not be able delve into the required introspection deep enough to benefit from this post. Nor am I worthy of such kindness. I’m much better at being critical of myself. I share your feeling of lethargy – our power just returned yesterday and I really feel for you…That said, I think many of us are far better at being a good friend to anyone other than ourselves..I hope your power and spirit are both restored soon!! all i can say is…..wow. Good advice Mimi, happy Thursday to you also! You’re killin’ me…I’m off to a kinder, gentler workout at the gym. No Endomondo, just good music.